Right now, McCormick & Schmick’s Seafood Restaurants are giving guests the opportunity to “Discover America’s Crab” with a special menu showcasing several varieties and preparation styles for crab. With everything from Regional Crab Cakes to King Crab Legs to Lobster Ravioli Topped with Blue Crab on the menu, there’s something to please every palate. 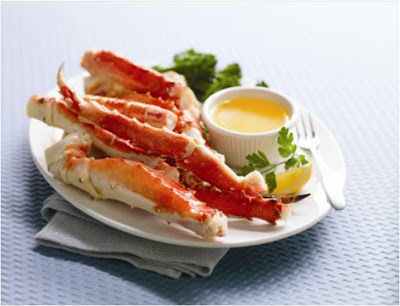 King Crab is known for meaty claws and legs and a full, rich flavor. The size of a King crab can be up to six feet from toe to toe. 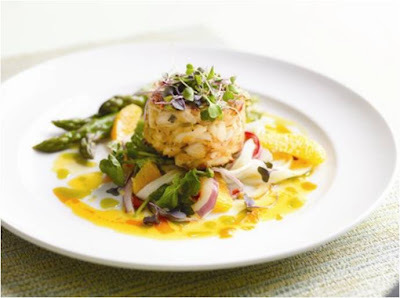 Blue Crab has a tender texture with a rich, buttery taste. Blue crabs walk sideways on their middle three pairs of legs. Ok enough with the edumacation lession, onto the menu items! Due to the overwhelmingly positive response from the Kiss a Stranger promotion I posted previously, McCormick and Schmick's wants to reward another financefoodie.com reader with a special gift. This time, they treating one lucky fan with lunch, dinner, or happy hour in the form of a $25 McCormick and Schmick's gift card! Contest ends on March 25, 2010 at 5pm EST. Winners will be chosen via random integer generator on random.org announced on the financefoodie.com site shortly afterwards that night! I am most excited to try the Regional Crab Cakes! YUM! I am a big fan of the Crab Cakes! In White Wine Cream Sauce with Roasted Tomatoes and Spinach"
I would like to try the Regional Crab Cake. and they can't seem to look away... I will definitely be trying this one! 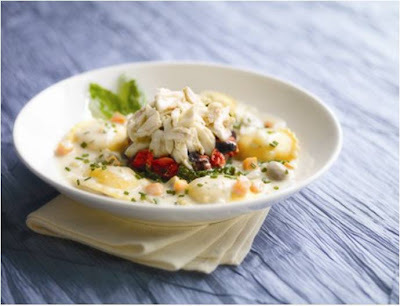 The Lobster Ravioli Topped with Blue Crab looks good. I have to agree, this totally appeals to me! im most interested in the lobster ravioli with topped crab meat!!! I would LOVE to have the King Crab Legs! Yum yum. The Lobster Ravioli with Blue Crab sounds unbelievable. Thanks for the chance! I would pick the King Crab Leg Dinner! It is rare to find that as an entree. I'd love to try the lobster ravioli topped with blue crab meat. Mine is the 1 lb King Crab Leg dinner, too. Sushi also sounds good. I tried the wonderful Lobster Ravioli with blue crab. Now I'm ready to try the King Crab Dinner. Definitely 1LB King Crab Leg Dinner! I would love the Crab cake! I'm most excited about the Regional Crab Cakes -- in fact, I might hit up their happy hour on Monday! I'd like to try the Regional Crab Cake. I'd love to try the Regional Crab Cake! The Crab cakes for sure - I love them! Facebook Fan of McCormick & Schmick's. The Regional Crab Cake sounds best to me! I so want to try those crab cakes. I'd like to try the Create Your Own Crab Surf & Turf. The best of both worlds. Thanks for the giveaway. I want to try the Lobster Ravioli Topped with Blue Crab! I would most like to try the Regional Crab Cake. Crabcakes would be my choice. I am most excited about Lobster Ravioli Topped with Blue Crab. I'm following McCormick & Schmick’s on Twitter (I'm @ThriftyJinxy). Regional Crab Cake sounds great! If it weren't for the onions, I would pick the crab cake, but I'm going to go with the ravioli. Thank you for the giveaway! omg. the king crab legs for sure! I want to try the The Lobster Ravioli with Blue Crab. I'd like to try the Lobster RAvioli Topped with Blue Crab. For me it would have to be the crab cake-I absolutely love crab cakes and order them whenever they are on a menu. I follow Mccormicks & Schmicks on twitter @Aearted. The Lobster Ravioli Topped with Blue Crab sounds so amazing. I LOVE seafood. I follow you on Twitter (@Hotsnotty2) Thanks! In White Wine Cream Sauce with Roasted Tomatoes and Spinach, thanks! I am also excited to try the 1 pound King Crab Leg Dinner!!! i want the lobster ravioli! The lobster ravioli description made my mouth water! Holy Moly does that Lobster Ravioli with Blue Crab sound absolutely divine! Good thing there's a McAndSchmick around the corner, I'll have to drop by even if I don't win :) Thanks! The crab surf & turf... filet mignon and a crab cake, please! YUM! totally the 1lb crab leg dinner. crab is my fave food group. I would love to try the Lobster Ravioli Topped with Blue Crab. Thanks. I'm Following McCormick & Schmick's on Twitter also. I really want to try the Crab Turf & Surf! The lobster ravolli is my choice now but when I get to the restrauant I may change my mind and have the crab legs. I am most excited to try the Lobster Ravioli Topped with Blue Crab. I would like to try the King Crab dinner as well - yummy! The ravioli also sounds great. i'd like to try the California sushi roll! The Lobster Ravioli sounds very tasty! I'll try the crab cakes. Thanks for the contest. Okay: true confession no one could stop me from odering the King Crab Legs by all time absolute favorite food! "Create Your Own Crab Surf & Turf"
Pair a 6oz Filet Mignon with your choice of Crab Leg Sections, our Crab Cake or have your Filet Prepared Oscar-Style, topped with Crab, Asparagus and Hollandaise (any and or all combinations available) sound sound utterly divine as well! I am going to Seattle in a few weeks and I would love to try the Lobster Ravioli Topped with Blue Crab In White Wine Cream Sauce with Roasted Tomatoes and Spinach. This sounds heavenly.